Head of the Al-Hikma National Movement, Sayyid Ammar al-Hakim, participated in the meeting of the major bloc core which will form the future government at the Rashid Hotel in Baghdad Sunday 19/8/2018, The meeting included in addition to the Al-Hikma blocs, the Saairun bloc led by Sayyid Moqtada al-Sadr, the Al-Nasr bloc led by Dr. Haider Abadi, and the National list. His eminence stressed on rejecting of quotas, hold the corrupt accountable and the adapting of the recommendations of the supreme religious authority in Najaf as a roadmap for the next phase. His eminence stressed on openness to partners in the country to form the largest bloc, noted that this alliance is a cross-sectarian alliance that rejects all forms of quotas, and emphasized on hard work to build a state of citizenship, justice and equality so to provide a decent life for all people in addition to find effective contribution to form a government capable of providing services, reconstruction And, resettlement of displaced families, and fight against corruption and corrupts, emphasized the importance of providing new faces of sons of Iraq to contribute in building during the next phase. 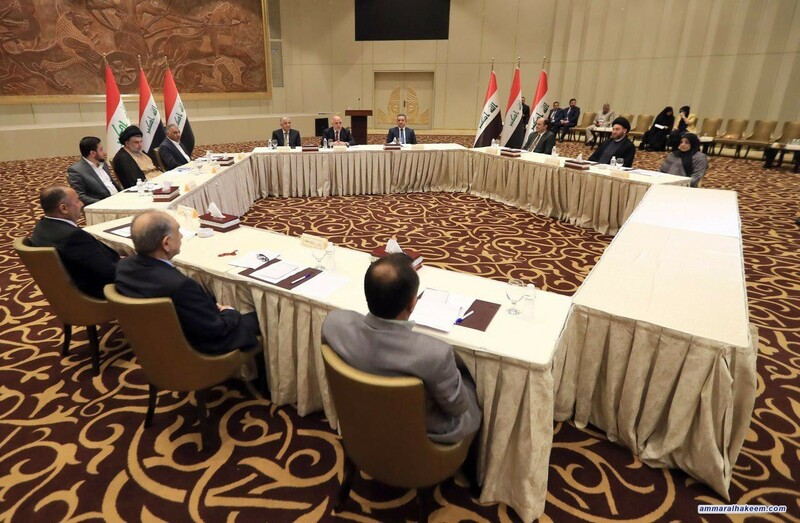 The meeting also covered forming specialized committees to negotiate with the remaining political blocs in order to prepare the political program of the government.